In June 1963, John Fitzgerald Kennedy has been president of the United States for almost two and a half years. That spring he is grappling with the two seismic forces of the early 1960s: the proliferation of nuclear arms and the struggle for civil rights. There were 1,036 days in the presidency of John F. Kennedy. This is the story of two of them. 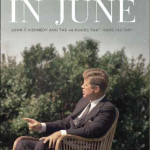 “Because of his signal achievement in Two Days in June, no one will be able to write about – no one will be able to think about – John Kennedy ever again in quite the same way.” – David M. Shribman, Winner of the Pulitzer Prize. Andrew Cohen is an award-winning journalist and former Washington correspondent whom the New York Times has called one of “Canada’s most distinguished authors.” A native of Montreal, he attended Choate Rosemary Hall, McGill University, and the University of Cambridge. Among his best-selling books is While Canada Slept: How We Lost Our Place in the World, a finalist for the Governor General’s Literary Award for Non-Fiction. He has written for UPI, Time, and the Globe and Mail from the United States as well as London, Berlin, Toronto, and Ottawa, where he is a professor of journalism and international affairs at Carleton University. He writes a nationally syndicated column and is a regular commentator on television and radio.